Unfolding in the Pinacoteca Luz, “Ernesto Neto: Sopro” (Blow) brings together sixty works, curated by the museum’s director Jochen Volz and chief curator Valéria Piccoli, focusing on the three-decade production of the Rio-born, fifty-five-year-old sculptor often considered Latin America’s most influential contemporary artist. 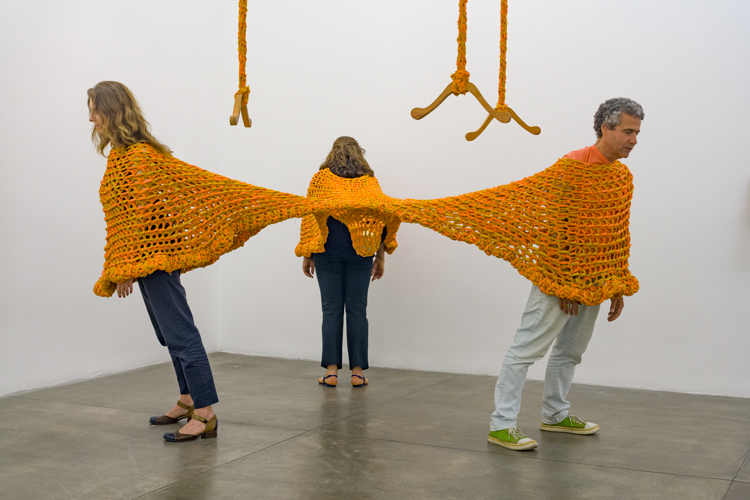 Neto’s oeuvre is sensorial in its essence—there to be touched, played with, handled, walked in, sat on, smelled… Above all it transforms the viewer into participant. 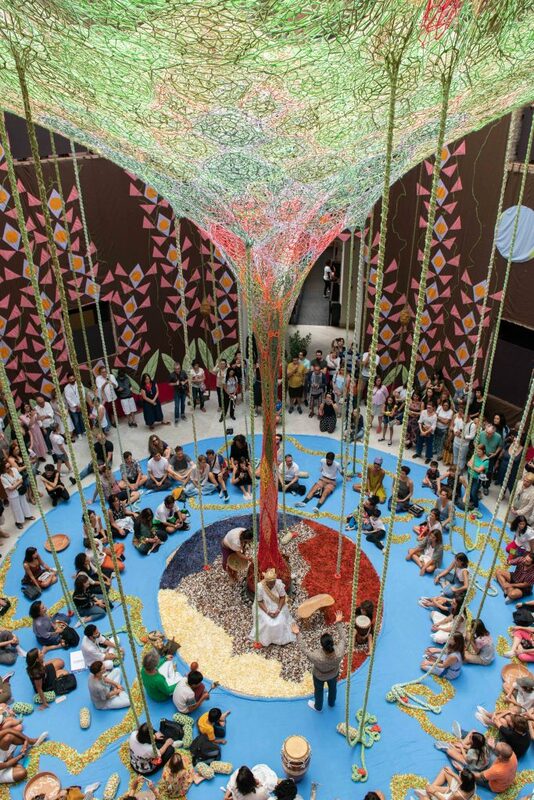 The Octagon hall, the São Paulo museum’s eight-sided domed central area, is now covered by a majestic forest installation especially woven for his largest show in his native country. 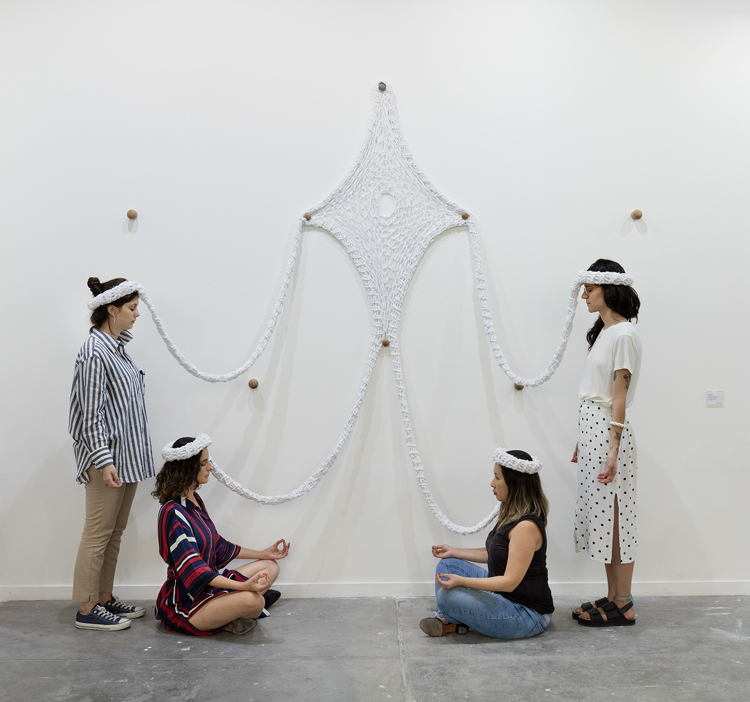 The title, “Cura Bra Cura Té” (2019), a peculiar portmanteau word—the artist’s preferred way to name his works—roughly means “cure Bra (zil), cure thyself.” The aromatic in situ work is a communal space of gathering, sheltering rituals, celebrations and immersive contemplation, central concepts in his art. It is hand-woven by thousands and thousands of nozinhos, or little knots, a characteristic Brazilian rustic crochet style made by poor communities that Neto supports and has partnered with in several works. 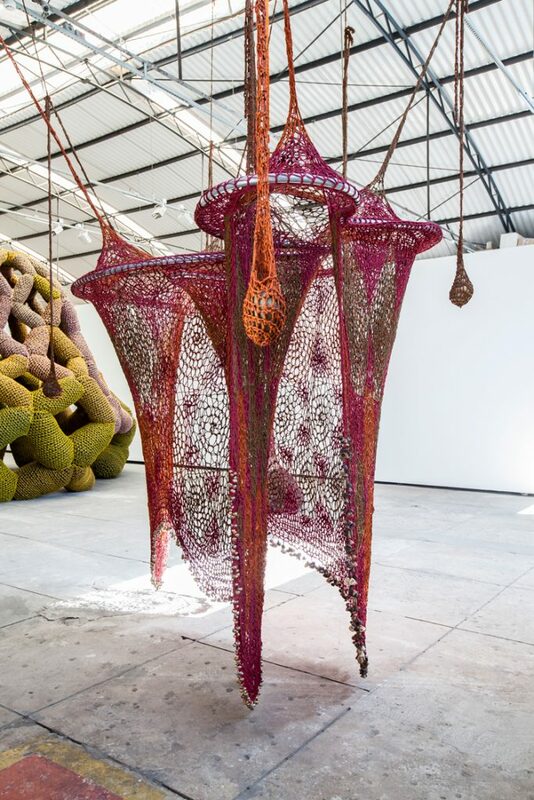 Dangling at the center of the knotted structure, counterbalanced by stringed “creepers” stacked with spices, hangs an enormous sack full of sacred medicinal leaves used in rituals of the Afro-Brazilian religion Candomblé and the Huni Kuin, an Upper Amazon Indian nation with whom he has collaborated since 2013, and crucial for his “rebirth” as he reveals in our interview. In 2014, the artist showed “The Body that Carries Me” in Bilbao’s Guggenheim but it was the following year that brought his big leap with the help of today’s Peggy Guggenheim, Francesca von Habsburg, head of Vienna’s Thyssen-Bornemisza Art Contemporary foundation, better known as TBA21. Invited by Neto, the archduchess and artist travelled by air, land and river to meet the Huni Kuin in their home environment. 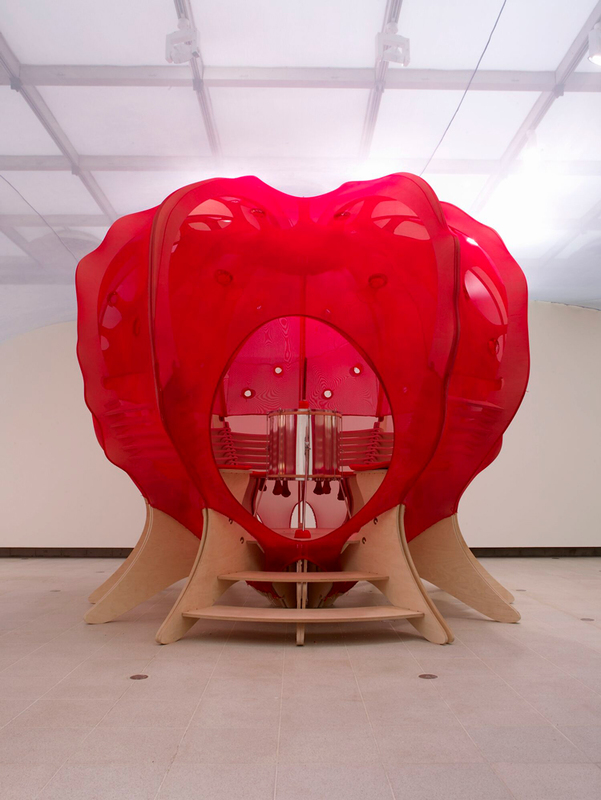 The adventure resulted in a grand forest dome-like structure mounted for the “Ernesto Neto and the Huni Kuin – Aru Kuxipa, Sacred Secret” exhibition in 2015 in Vienna’s TBA21–Augarten Park, marking the artist’s initial co-authored work with the Huni Kuin people. For the opening week, a group of shamans were flown over for Neto’s threefold exhibition that also involved the Upper Belvedere museum and a two-decade retrospective at the Kunsthalle Krems. 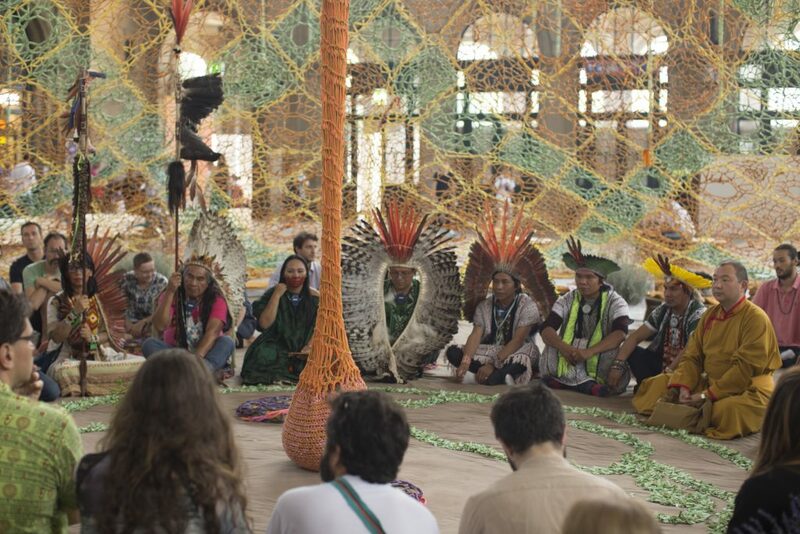 Donned in feathered headdresses and beaded attire, the shamans engaged in healing rituals in the city park under an enormous tent entirely woven by little knots made by Rio’s poor communities. This cooperation accentuated Neto’s work in the path of “appreciation of the sensuality of being, the unity of bodies and nature, the celebration of life, and a search for deeper forms of union and correspondence.” The work’s wit, blending contemporary art, a poor Rio community and Huni Kuin secular Amazonian knowledge, stunned Vienna and the art world. 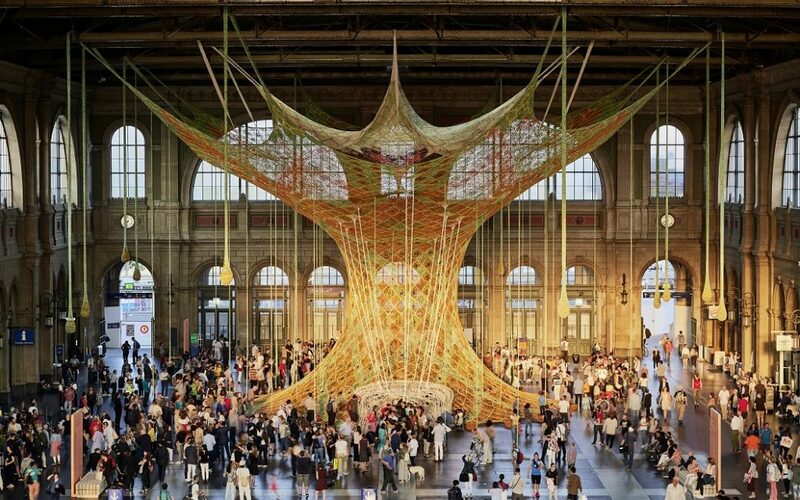 In 2018, Neto produced his largest work to date, “GaiaMotherTree,” a monumental walk-in installation, funded by the Beyeler Fondation, set in the grand hall of Zurich’s Central Station, Switzerland’s largest. 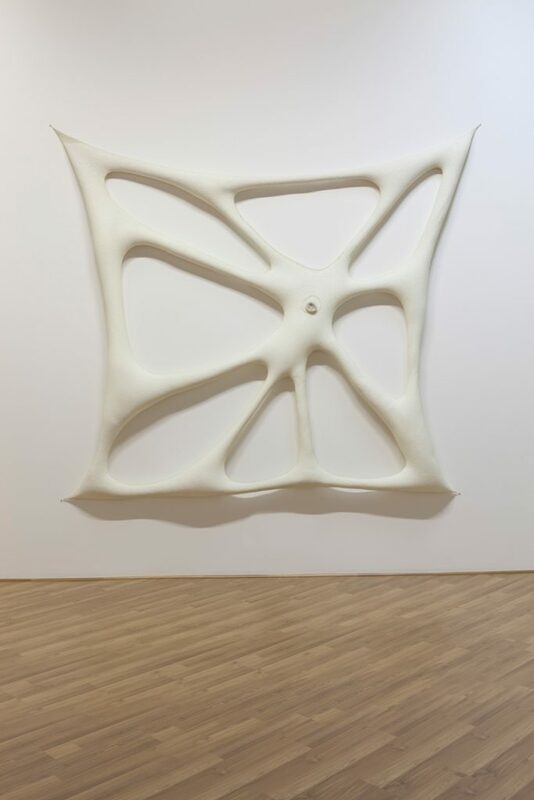 Described by some as “beyond abstract minimalism,” Ernesto Neto’s work has been awarded the Chevalier de L’Ordre des Arts et des Lettres by the French government. His interest in mathematics, physics and gravity drew him to engineering and astronomy, and finally led him to take up sculpture at EAV/Parque Lage in Rio, where he still lives and works. Other important exhibitions are Boa, Museum of Contemporary Art Kiasma (Helsinki, Finland, 2016); Rui Ni / Voices of the Forest, Kunsten Museum of Modern Art (Aalborg, Denmark, 2016); Haux Haux, Arp Museum Bahnhof Rolandseck (Remagen, Germany, 2014); Hiper Cultura Loucura en el Vertigo del Mundo, Faena Arts Center (Buenos Aires, Argentina, 2012); La Lengua de Ernesto, MARCO (Monterrey, Mexico, 2011); and Dengo, MAM (São Paulo, 2010). The artist has participated in the biennials of Venice (2017, 2003, 2001), Lyon (2017), Sharjah (2013), Istanbul (2011) and São Paulo (2010, 1998). Neto’s work is present in several collections, among them Centre Georges Pompidou (Paris), Inhotim (Brumadinho), Guggenheim (New York), MCA (Chicago), MOCA (Los Angeles), MoMA (New York), Museo Reina Sofía (Madrid), SFMOMA (San Francisco), Tate (London) and TBA21 (Vienna). 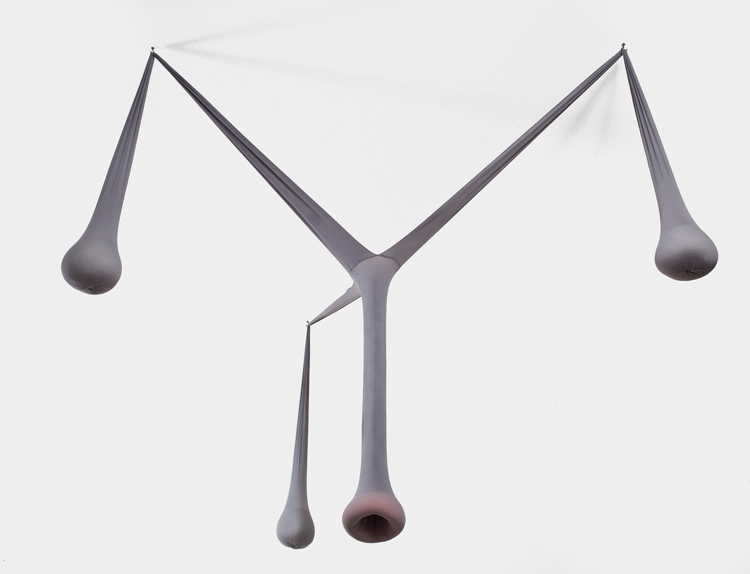 He is represented by São Paulo-based gallery Fortes D’Aloia & Gabriel. Ernesto, do you define yourself as a sculptor? Yes, I am a sculptor. 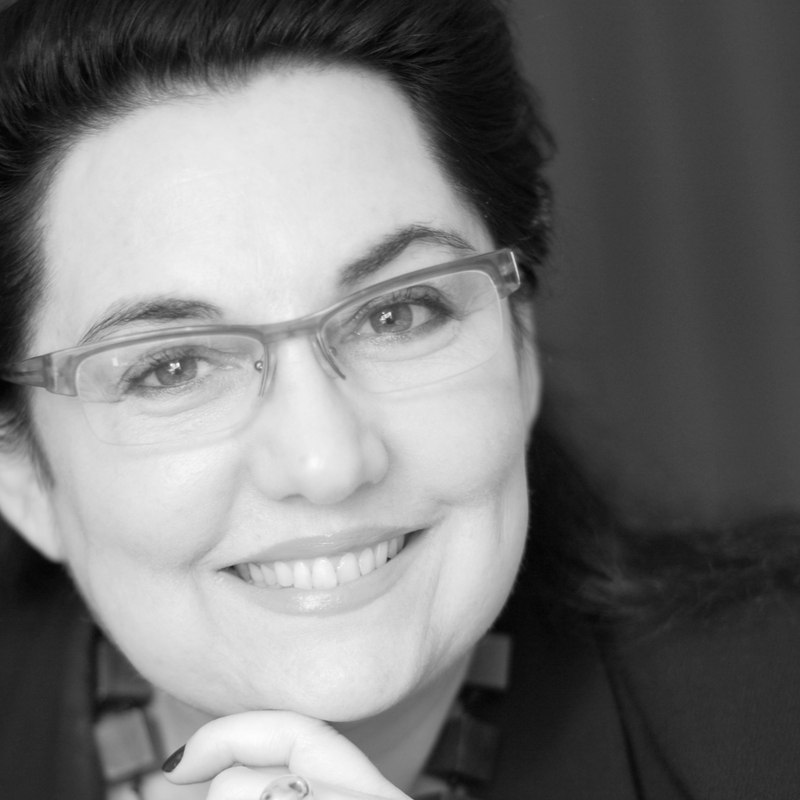 So what led you to the principle of interactivity in the arts? I think it all comes from Brazilian culture. Since the beginning, our roots gave way to an interactive culture; for example, the roda de samba [samba dance circles] is an interactive activity. We not only like to dance together but we also enjoy building things together. When Lygia Clark united art with this principle of interactivity together with Helio Oiticica in the late 1960s they were actually dealing with this ancestral energy from our native Indian and African cultures that form the basis of Brazilian culture. In the Indian and the African cultures, daily life is led by the group for the group’s wellbeing and moved by group rituals. All these influences distinguishes Brazilian culture. 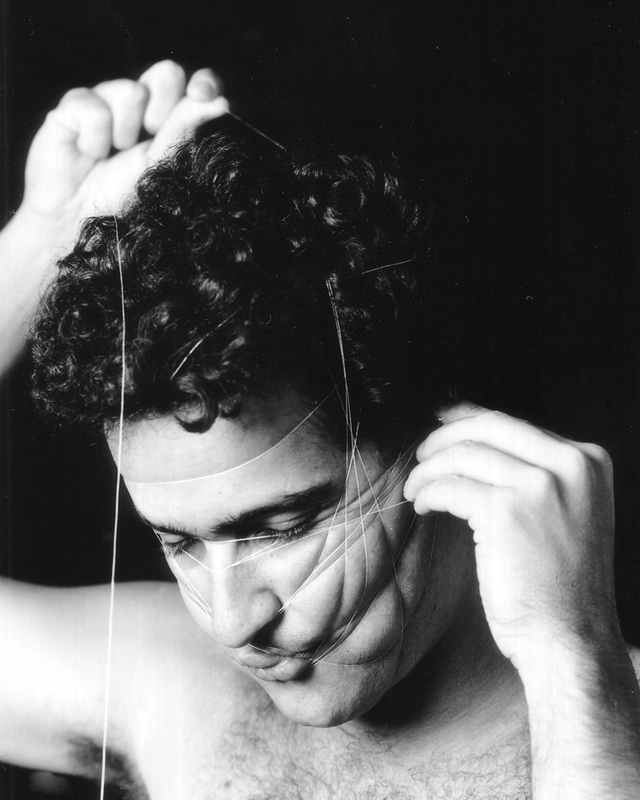 Since you mentioned Lygia Clark (1920-1988), does your work “M.E.D.I.T.” (1994), a series of seven black-and-white portraits of you that goes by the name “Metamorfose Espiritual do Inconsciente Topológico” [Spiritual Metamorphosis of the Topological Inconscient], on show at the Pina, pay homage to her 1973 work “Baba Antropofágica”? In the back of my mind I certainly must have remembered “Baba” when I did “M.E.D.I.T.” in the 1990s. One day I woke up with the urge to do it. I described it to my friend, photographer Murillo Meirelles, who immediately said we should have it photographed. Lygia has always been a reference for me, but both works, hers and mine, were made in different contexts, different times. “M.E.D.I.T.” deals with rebirth—we are enclosed in our cocoon and suddenly we are reborn. 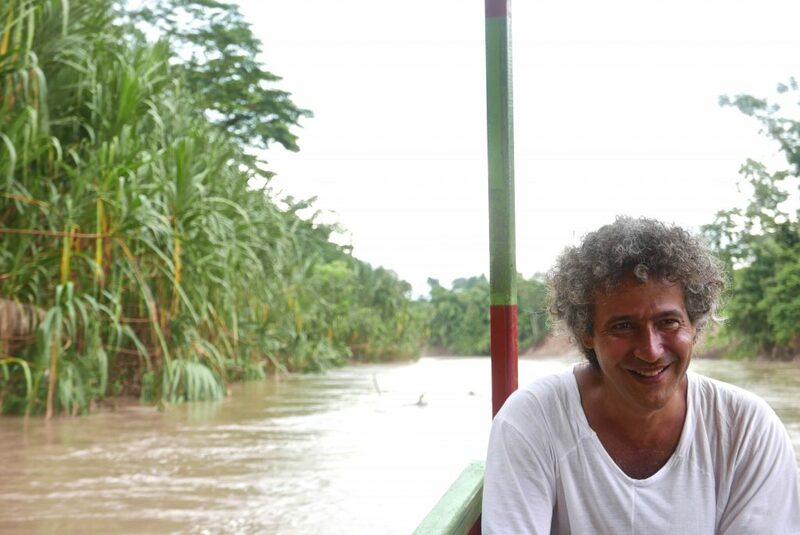 On the subject of rebirth, did yours occur in 2015 with your relationship with the Huni Kuin indigenous people of the Upper Amazon region? Tell us about your relationship with Huni Kuin. Between us it has always been a relationship based on exchange. We did a big work together in Vienna, in 2015, at the TBA21-Augarten Park. The work was sold, one third went to them and they created a co-op and I’ve been to Acre state several times to help them out. This exchange we have is also important to them because they face material difficulties. Our arrival as “white men” also involves them having to buy very standard things in our society such as gas and clothes that they did not need before. Plus, our bodies carry toxins their bodies have never been in contact with before. We are always trying to help them out by promoting their work. As for me, what I can offer them is to share is my space as an artist so they can show their work, their knowledge, and when there is financial gain we always share it with them. Things should be shared, not divided, sharing brings the idea of adding up to all those involved. So is sharing the core idea you want to convey in your work? Sharing is fundamental in this story that talks about love. To share comes from love that means to give and to receive. When your soul overflows it achieves a sharing state. When we take away fear from our hearts we engage in the act of sharing. Now let’s move on to the women of Rio’s poor communities who do with their own hands the thousands and thousands of nozinhos, the crochet technique used in your work. It’s not only women—there are men, too—in the group. They are wonderful people! Like the Huni Kuins they suffer tremendous hardship due to Brazil’s dramatic social condition. We try to give them a better pay, however the country does not provide institutional, social or educational support. Nevertheless they are so resilient, so strong in their daily battle. Recently, Carla, the mãe de santo [candomblé priestess], an inspirational old lady who heads the nozinhos artisan community, was not feeling too good, so I asked her if she didn’t want to go home to rest. She immediately replied: “No, Ernesto, absolutely not! I love my work! The minute I stop it will only get worse.” They deserve a lot of respect. You practice yoga. You meditate. You are semi-vegetarian. You participate in the Huni Kuin ceremonies. You are for the medicine of the forest. You are connected to nature, to the people. All this together comes through in your art as if you’ve had been given a third eye. Where did this third eye come from? The third eye is the Brazilian flag. I’ve been told that it is the eye of the curica parrot, a tropical bird with a very sharp eyesight, but the flag’s “eye” is blindfolded. We must take it off to free Brazil and free the country from the phrase on the blindfold: Ordem e Progresso [order and progress]. The Mangueira samba school in Carnival had a wonderful phrase on its flag: Índios, Negros e Pobres [Indians, Blacks and the Poor]. For Brazilian people to shine we should have no phrase on our flag but if we should adopt one, Mangueira’s phrase is my heart’s choice. 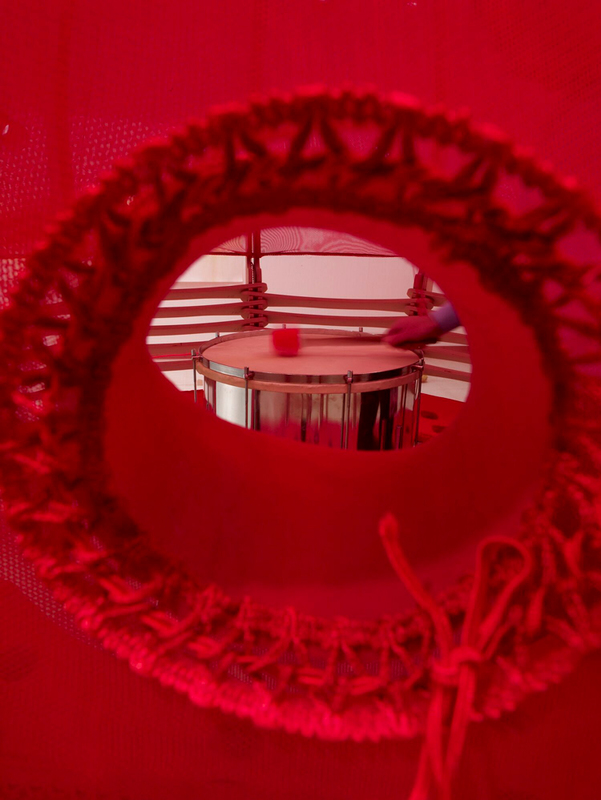 Now tell us about “Cura Bra Cura Té,” the in situ installation you created specially for the Octagon, the central area of the Pinacoteca Luz museum. “Cura Bra Cura Té” deals with healing. It is imbued with the feminine knowledge of the forest with sacred, medicinal leaves used in the rituals of the Candomblé and the Guarany Indians: akokô, são gonçalinho and mate herb. At the center of the octagonal space, the sacred leaves are afloat in a large sack, counterweighted with tons of aromatic spices. 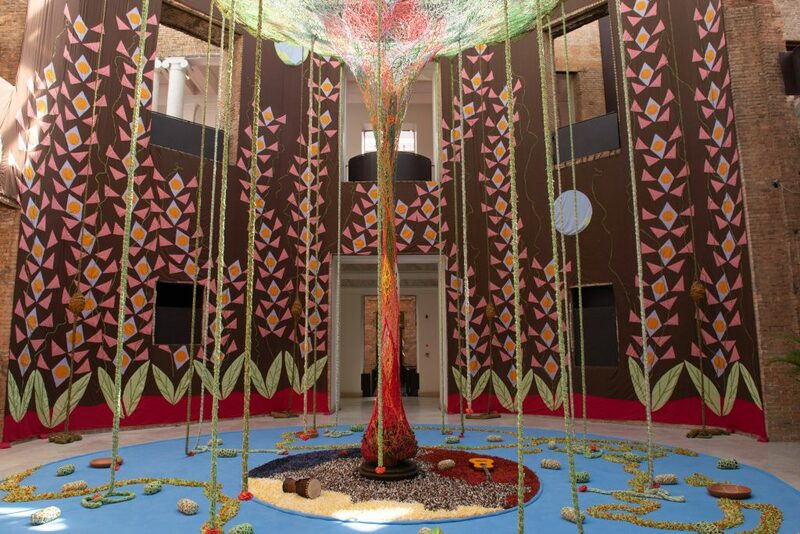 On the floor, a rug displays planet Earth with Brazil’s map woven up by nozinhos and there is a representation in equal spaces of the three ethnicities that make up the country’s social fabric: the Indians, the Afro-descendants and the Europeans. At the center of the rug there is a wooden pole used for torturing slaves. Through its powerful maternal embrace, the forest will heal this brutal system that affects both the oppressed and the oppressor. On the surrounding walls, from top to bottom, there are paintings of tropical plants like the pothos creeping over the walls onto the heavens in a style known as Kene, a lozenge graphic design characteristic of the Huni Kuin culture, to symbolize the deconstruction of the Brazilian flag. Who are the artists who influence your work? From Brazil: Lygia (Clark), Hélio (Oiticica), Franz Weissmann, Amilcar de Castro, Sergio Camargo, Cildo Meirelles, Tunga, Waltércio (Caldas), (Artur) Barrio, Antonio Manuel, José Rezende and some friends of mine like Carlos Bevilacqua and many more of my talented friends. But above all there is Brancusi, for me the greatest of them all. Then comes constructivist art, minimalism, Arte Povera… and, of course, Duchamp. To wrap up what advise would you give a young struggling artist like you once were roaming in Rio in the 1980s now that you are a world-renowned name in contemporary art? Above all, you have to believe in art and its radiating energy. Do not get deluded with the pressure from the art market. Being a Brazilian artist opens doors but you have to be connected to the world. Always remember the figure of a tree, with its roots nurtured deep in the Earth and its treetop high above getting all that precious light. If you are able to live your life replenished and understanding this, whether you’re an artist or have another profession, you are bound to find your place in the universe.